Home > Problems > Why is There a Shortage of Affordable Housing? The current lack of affordable housing is a result of several factors which together have made house prices extortionate and left potential home owners with no other options but to continue renting. The main issue which is causing a lack of affordable housing is the national shortage of housing. As in any industry when demand outweighs supply prices increase. The Government has pledged to increase the number of houses being build but even the targets they are setting may not be good enough to solve the problem. The Land Registry claims the number of news houses being built each year rose from 130,000 in 2001 by 55,000 to 185,000 in 2005. However this was not enough to make properties more affordable. The Land Registry estimate the average house prise has also risen from £98,342 in 2001 to £160,620 in 2005. 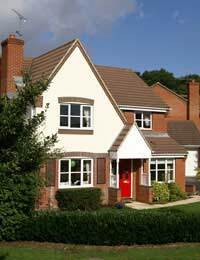 In 2007 the average house price was £183,896. A new housing bill published in November laid out the Government's plans to rectify the situation. The Housing and Regeneration bill claimed the Government would aim to build three million properties by 2020. Not only would it build more properties, but they would be greener and more affordable. However the plans were met with criticism with many industry experts claiming this would not be enough to solve either the housing shortage or the shortage of affordable properties. The National Housing and Planning Advice Unit, an independent group which advises the government on housing issues, has slammed the plans claiming three million homes by 2020 is not enough. The NHPAU says the Government should aim to build 270,000 houses a year as opposed to 240,000 and that this is the only way to ensure affordable housing. Of course the current climate in the mortgage market is not going to help the situation. During 2006 mortgage lenders in the UK were extremely lenient. Mortgages at five times income were offered - meaning someone earning £30,000 a year could get a mortgage for £150,000. Borrowers could take out bigger mortgages than before and even though house prices were rising they could get by. However in 2007 the US found itself in the middle of a credit crunch after many people took out mortgages they could not afford and as a result could not pay them back therefore crippling many of the lenders. This had an effect on UK lenders who soon become more cautious. Lenders in the UK are not lending money to each other as they used to do and therefore rates and products on offer are suffering. And the three interest rate rises this year didn't help. Lenders dropped not only the amount they would lend (income multiples) but also the percentage of the house price they would lend. Where once they would lend 100% of the house price they began lending 75 or 80%. The interest rate dropped in December and so this could be on the up for borrowers but until the housing shortage in rectified this may not do them any good. The NAPAU claim house prices could be as much as 10 x the average income by 2020 if the Government does not raise its target.